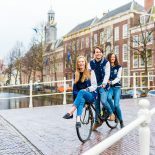 Have you just moved to Leiden and are looking for a bicycle? Cycling is definitely the fastest way of getting around in Leiden. A bicycle is even a necessity if, for instance, all your lectures are not being held in the same building and you have your fifteen minutes to get from place A to place B. You may have noticed that many Facebook groups are filled with advertisements in which people are selling their bikes. While you may find a trustworthy person selling a real gem, it’s much more likely that you end up paying for a stolen bike. Selling, but also buying, a stolen bike is a crime in the Netherlands. It is unlikely to get into trouble after accidentally buying a stolen bike, but since you never know, I wouldn’t risk it. Besides, a lot of bikes are getting stolen in the Netherlands every day and we don’t want to support this sort of business in any way, right? So, instead of doing any questionable online shopping, go to a bike shop and get your bike there. You don’t need to pay hundreds of euros (if you don’t want to) because there are several bike shops in Leiden that sell second-hand bikes as well. I bought mine more than two years ago in Profile De Klokpoort, and my reliable steed (in the picture below) is still going strong. Google “fietsenwinkel Leiden” and you’ll find many more options! While those black grandmother-style bikes (or omafietsen in Dutch) seem so very local, they are also the most stolen ones. Therefore, get as colorful and recognizable bike as you can find instead! Such bike is also easier to find among dozens of other bikes of the bicycle storage, and that does matter as you will soon notice. When I moved to the Netherlands, everyone advised me to pay 80 euro at max for a used bike. Well, I gotta admit I didn’t take that advise. Instead, I paid about 150 euro. If you come to Leiden for just a year, that 80-euro advice makes sense. However, if you’re planning to stay for at least three years and do not wanna buy a new and as-cheap-as-possible bike every year and you wanna cycle outside of the town as well, I’d advise you to not to stubbornly stick to that rule if your bike-seller has a nice bike to offer for a little more money. It’s good to notice that the cheapest bikes often have most broken components as well. Therefore, it may not be as cheap as it looks like. There are no department stores or hardware stores in the Netherlands that don’t sell any bike supplies. So, when you need a new lamp, bike pump, basket, rain trousers – you name it ­– take a look at the selection of Gamma or Hema, for instance. They have a nice selection of bike accessories for reasonable prices. I would have loved to read some tips about finding my cycle in the parking lot. haha. I sometimes used to lose track of where I parked my bicycle and spend a considerable amount of time looking for it. I then colored it a very garish orange, it doesn’t always look that great but I do have an easier time of finding it. You don’t always have to go into a shop to buy the bike. If you know someone personally, who is selling one then you could buy from them too right? Thanks for sharing your tips. This entry was posted on September 11, 2017 by ajhaapala in Practical Stuff, Uncategorized and tagged bicycles, Cycling.